Background & Objective: Medicinal plants have attracted great attention in the recent years and is increasingly applied instead of the chemical drugs. Several documents showed that herbal medicine traditionally and clinically applied in the cure and prevention of several diseases. In the recent years, different medicinal plants and their main components have been chosen in neurological therapy. The less toxic effects, availability, and lower price of medicinal plants versus synthetic substances make them as excellent and simple selection in the treatment of nervous diseases. Nigella sativa (N. Sativa) L. (Ranunculaceae), well recognized as black cumin, has been utilized as a medicinal plant that has a strong traditional background. Thymoquinone (TQ) is one of the main active components of the volatile oil of N. sativa seeds and most effects and actions of N. Sativa are mainly related to TQ. The several pharmacological properties of N. sativa and TQ have been found, for example; anti-tumor, anti-microbial, anti-histaminic, immunomodulatory, anti-inflammatory, and anti-oxidant effects. Many reviews have investigated this valuable plant and its components, but none of them focused on their neuroprotective effects. Therefore, the aim of the present review was to show comprehensive and neuropharmacological properties of N. sativa and TQ. In this review, various studies on scientific databases regarding the effects of N. sativa and TQ in neurological diseases have been introduced. Studies on the neuroprotective effects of N. sativa and TQ which were published between1979 and 2018, were searched using various databases. The results of these studies showed that N. sativa and TQ have the protective effects against neurodegenerative diseases, including; Alzheimer, depression, encephalomyelitis, epilepsy, ischemia, Parkinson, and traumatic brain injury have been discussed in the cell lines and experimental animal models. Although there are many studies indicating the beneficial actions of this plant in the nervous system, the number of research projects relating to the human reports is rare. Conclusion: Therefore, better designed clinical trials in humans are needed to confirm these effects. Keywords: Anti-inflammation, antioxidant, Nigella sativa, neuroprotective, thymoquinone, apoptosis. Keywords:Anti-inflammation, antioxidant, Nigella sativa, neuroprotective, thymoquinone, apoptosis. Abstract:Background & Objective: Medicinal plants have attracted great attention in the recent years and is increasingly applied instead of the chemical drugs. Several documents showed that herbal medicine traditionally and clinically applied in the cure and prevention of several diseases. In the recent years, different medicinal plants and their main components have been chosen in neurological therapy. The less toxic effects, availability, and lower price of medicinal plants versus synthetic substances make them as excellent and simple selection in the treatment of nervous diseases. Nigella sativa (N. Sativa) L. (Ranunculaceae), well recognized as black cumin, has been utilized as a medicinal plant that has a strong traditional background. 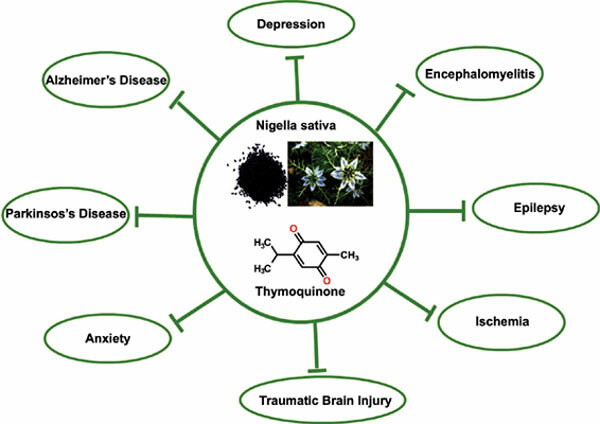 Thymoquinone (TQ) is one of the main active components of the volatile oil of N. sativa seeds and most effects and actions of N. Sativa are mainly related to TQ. The several pharmacological properties of N. sativa and TQ have been found, for example; anti-tumor, anti-microbial, anti-histaminic, immunomodulatory, anti-inflammatory, and anti-oxidant effects. Many reviews have investigated this valuable plant and its components, but none of them focused on their neuroprotective effects. Therefore, the aim of the present review was to show comprehensive and neuropharmacological properties of N. sativa and TQ. In this review, various studies on scientific databases regarding the effects of N. sativa and TQ in neurological diseases have been introduced. Studies on the neuroprotective effects of N. sativa and TQ which were published between1979 and 2018, were searched using various databases. The results of these studies showed that N. sativa and TQ have the protective effects against neurodegenerative diseases, including; Alzheimer, depression, encephalomyelitis, epilepsy, ischemia, Parkinson, and traumatic brain injury have been discussed in the cell lines and experimental animal models. Although there are many studies indicating the beneficial actions of this plant in the nervous system, the number of research projects relating to the human reports is rare.